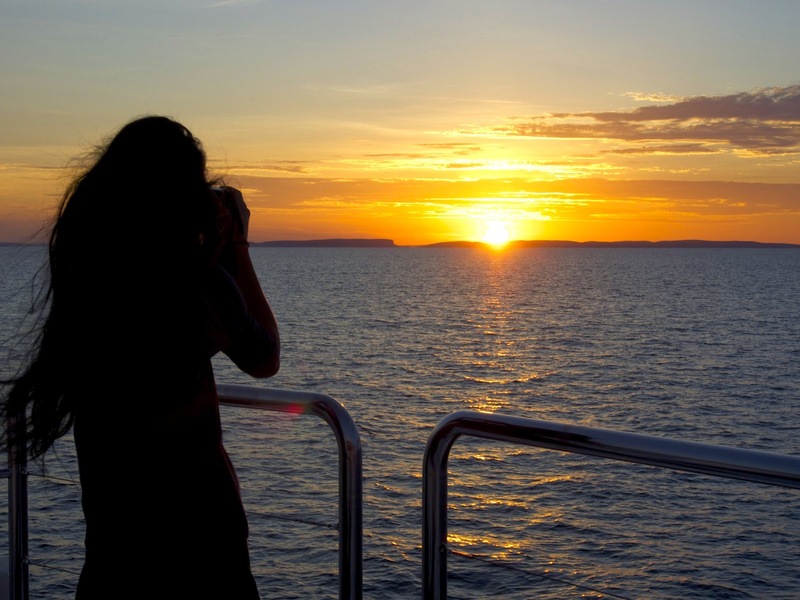 Early starts aren't obligatory on the Kimberley Quest, but who would want to miss out on sunrises like this? We were a bit late getting to the Montgomery Reef because the tide was running so strongly. Tides are a big deal up here and neap and flood and spring are just everyday vocabulary. The moon is new and it's spring, so that means the high and low are currently at their extremes, and the flow in-between is so powerful that an incoming tide makes waves on the river as it flows out to the sea. The Montgomery Reef is immense, about 400 sq km in area, and as the tide falls it seems to rise up out of the ocean, fringed with waterfalls. Don't go thinking Table Mountain, it's only about 4 metres above the sea at lowest tide, but that still makes for a remarkable and unusual effect. We got up close to it in the tenders, poking along watching the water spilling over the edges, and spotting turtles gathered there hoping to catch fish as they were carried over by the rush of water. Turtles, incidentally, are nothing like as slo-mo and laid-back as that one in Finding Nemo: shocked to notice suddenly that we were there, they powered away with plenty of splashing. There were also reef sharks, and egrets, but no dugongs or rays for us today. That was the up-close version: next we took turns with Guy in the helicopter on the roof for the overview. Yup, huge. Turquoise, blue, white, black. Mangrove islands, blue holes, sandbars, creeks. And one small white boat. Then Guy moved off for a bit and a different helicopter delivered Kenny and Callum to us, two young Aboriginal guys from Freshwater Cove who took us up a pretty steep and scrambly track to view some rock art. On the way there were biting green ants (bite them back, their bums are full of lemony Vitamin C), spiky spinifex grass, and lots and lots of sweat, so it was good to sit in the shade of an overhang with a gentle breeze blowing and listen to Dreamtime stories and look at the unusual winjanna paintings, 40,000 years old, done in the same red ochre that had been smeared on our cheeks (and was, on reflection unsurprisingly, rather difficult to remove afterwards). The temperature is still Wet-season high, 35 degrees-plus (it'll be a relatively balmy 30 later in the Dry) so we were all wringing wet when we got back: hooray for air-conditioning and showers. Roo for lunch, then a wallow in the spa pool on the front deck, with frequent visits from Olivia offering a Matso's (boutique brewery in Broome). The sunset brought lit-from-within cumulus clouds that gave us a bit of a lightning display as dark fell before pushing off and allowing Greg to give us an unencumbered view of the heavens for his astro-tour talk. It's always good to brush up your star-gazing, though lying flat on a lounger during it, in the warm dark after a busy day will mean there are gaps in the experience. But it was immensely relaxing, and the shooting stars were a bonus. So I forgave Greg his clue to one star's name being "Kiwi beer". No? Canopus!